I was reading a French magazine listing the 30 most beautiful cycling climbs in France and seeing Joux Plane there motivated me to climb it today. It has been on my list for a while and is perhaps the closest famous Col to our house. It has featured several times in the Tour de France. It is one of the very few climbs that has seen Lance Armstrong struggle. Back in 2000, when it last appeared, Richard Virenque left Armstrong far behind to win the stage. Perhaps home field advantage as Virenque is from nearby Annemasse. I climbed from the South side starting in Samoens (via Les Combes). The climb itself is just over 14 kms and quite steep with 3 kilometres at 10% grade and 4 at 9.5% grade. There is a stretch in the middle at 12% & 13% that hurt quite a bit! In general I felt pretty strong and climbed steadily. The surface over the last few kilometres is very poor with lots of gravel over the road (particularly worrying on the descent). At the top are absolutely fantastic views of Mont Blanc (mainly blocked by ominous dark clouds) and a man-made lake that is stocked with fish. 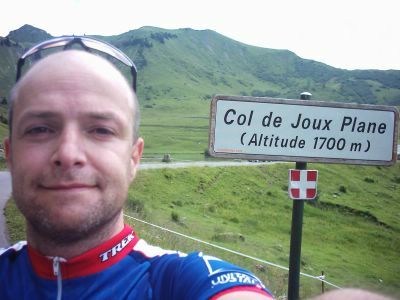 The Col is at 1,691 metres although the sign proudly claims 1,700! A further 2 kilometres of down and up brought me to the Col du Ranfolly – basically the top of ski slopes for the Lesget resort. A quick Crepe Confiture (Jam Crepe) and I shakily descended back to Samoen and then along flats to the resort town of Morillon where I had left the car.